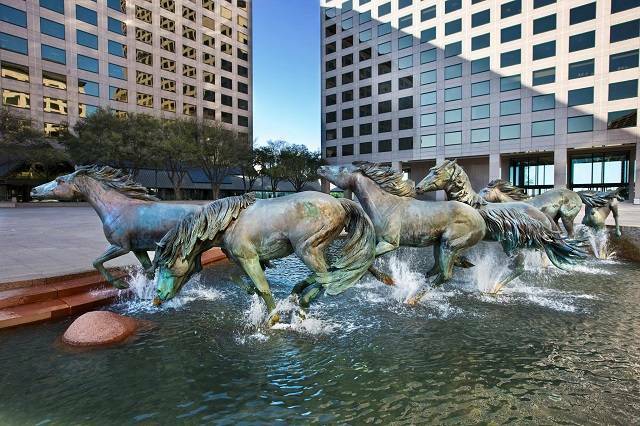 Considering a move to Irving, Texas? There are a few things you should know. For one, we’re an ideal home base for outdoor enthusiasts. Residents can enjoy stand-up paddle boarding through the canals that wind through Las Colinas, or jogging the Campion Trail‘s 10-mile loop, located just 10 minutes from Positano. Golfers can take advantage of the pristine greens at the Four Seasons Resort in Las Colinas, or watch the HP Byron Nelson Championship when it comes to town each May. Irving is also a paradise for foodies. Our annual food festival, Taste of Irving, showcases all the flavors of the city, from fast food favorites like Shin’s Donuts to more elevated dining options like Zeytin’s Mediterranean. Pick up some fresh, seasonal produce at the Dallas Farmer’s Market, or treat yourself to a legendary deep dish pizza cookie topped with Blue Bell vanilla ice cream at Palio’s Pizza Cafe in Las Colinas. A number of Fortune 500 companies have relocated to Irving, including Exxon Mobile, Nokia America, and the American headquarters of BlackBerry. You’ll find most of them in the high-rise center of Las Colinas, just minutes from the quiet residential streets of Positano. The city is now one of the fastest growing regions in America, thanks in part to its proximity to Dallas-Fort Worth (and the DFW and Love Field airports), and its growing array of shops, services, and amenities. Want more info on life in Irving, Texas? Check out Movoto’s quirky article 21 Things You Need To Know About Irving Before You Move There. Sitemap | Copyright © 2016 North American Properties, Inc.